"Cameras" and "Ladies of Marvel"
Now in its third year, the Austin Youth Film Festival will be held 9:30 a.m. May 9 at the Alamo South Lamar. The festival features short films made by Austin-area middle school, high school and home-schooled students. Co-founded by The Khabele School film teacher Alex Thomas (left), the festival’s goal is to foster a love of filmmaking among Austin's middle and high school students. Entries include the music video Cameras and the documentary Ladies of Marvel by Khabele School student Remy Dunagan (middle) and the chiller State of Being by Pflugerville High School student Erin Devany (right). 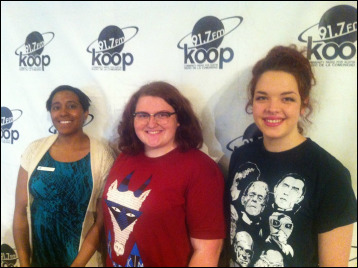 Alex Thomas and Erin Devany join Remy Dunagan during this interview.